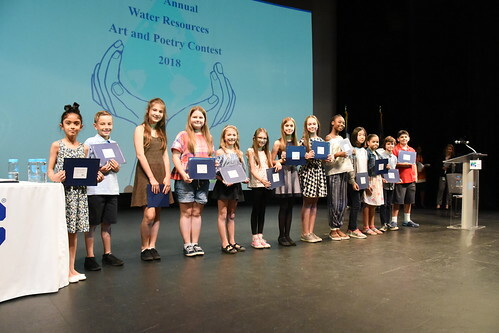 The New York City Department of Environmental Protection (DEP) hosted a celebration event for student participants in the 32nd Annual Water Resources Art and Poetry Contest at the Queens Theatre in Flushing last Thursday. More than 1,300 students (grades 2-12) from 75 schools in New York City, Watershed communities, as well as those who are homeschooled, were honored for creating more than 1,200 original pieces of artwork and poetry that reflect an appreciation for New York’s water resources, the drinking water supply, harbor water, wastewater treatment, and the importance of water conservation. Student entries also raised awareness about the importance of maintaining New York City’s critical water supply and wastewater infrastructure. At the event, students were honored for their outstanding work and received certificates recognizing their contribution. Additionally, a group of judges selected more than 60 entries as this year’s Water Champions. Water, A Precious Resource: To recognize the importance of a clean and plentiful supply of water. New York City Water Supply System: To explore the history of the New York City Water Supply System and its present-day source, operation, delivery, protection, maintenance, and stewardship. New York City Wastewater Treatment System: To examine the purpose of, and process for, cleaning used water in New York City and in the East and West of Hudson Watersheds. Harbor Water Quality & Healthy Marine Ecosystems: To discover the richness of our marine life and opportunities for recreation and commerce on local waterbodies; and to understand the work that is being done to monitor and ensure healthy water quality. Water Stewardship and Climate Change: What Can We Do To Help? To consider our influence on the environment and how we can address and help to resolve environmental issues that impact our neighborhoods, our city, and beyond. DEP manages New York City’s water supply, providing more than 1 billion gallons of water each day to more than 9.6 million residents, including 8.6 million in New York City. The water is delivered from a watershed that extends more than 125 miles from the city, comprising 19 reservoirs and three controlled lakes. Approximately 7,000 miles of water mains, tunnels and aqueducts bring water to homes and businesses throughout the five boroughs, and 7,500 miles of sewer lines and 96 pump stations take wastewater to 14 in-city treatment plants. DEP has nearly 6,000 employees, including almost 1,000 in the upstate watershed. In addition, DEP has a robust capital program, with a planned $19.1 billion in investments over the next 10 years that will create up to 3,000 construction-related jobs per year. For more information, visit nyc.gov/dep, like us on Facebook, or follow us on Twitter.